From Kni-Co, "As rugged as our Alaskan stove, the Alaskan Junior has the same front as the Alaskan, differing only in its depth, which is 18 inches instead of 24, meaning it is lighter and burns a four inch shorter piece of wood." 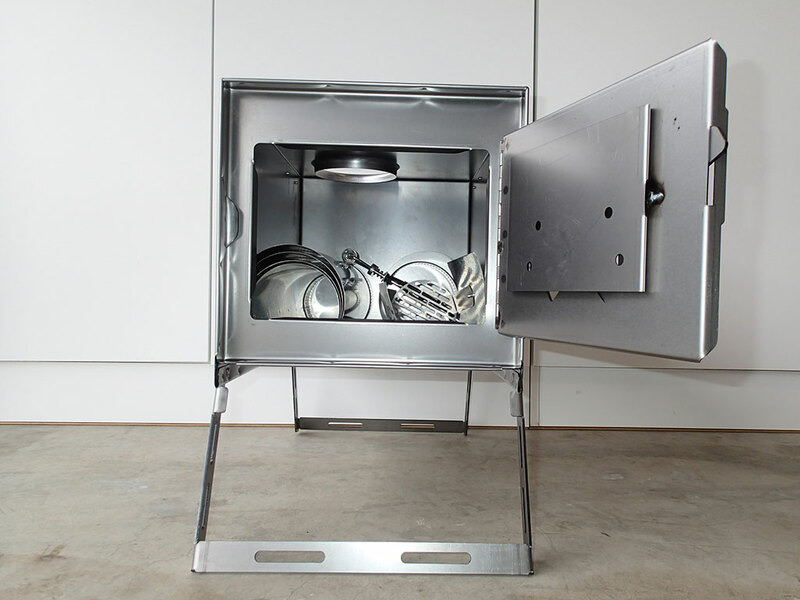 "Rugged and large, each stove is handmade in the United States to insure top quality. The Alaskan Junior can be set up with attachments on two sides (tables and/or watertanks. Other accessories for the Alaskan Junior are: tapered pipe(which comes in four 16" sections), spark arrestor, and a stack robber. You choose your own arrangement. The tables can sit on top of the water tanks. Most items fit inside the stove for easy packing and storage." "The stove pipe for the Alaskan Jr. consists of four 16" sections of tapered pipe. It is a little bit shorter than the pipe desgned for the Alaskan and Packer, this way it can fit inside the stove for storage." Packed Size: 12 in. x 12 in. x 18 in. Open Size: 20 in. x 12 in. x 18 in. Fire Box Size: 11-1/2 in. x 10-3/4 in. x 17-1/4 in. Stove Weight: 13 lbs 4 oz. Stove + Pipe Set Weight: 18 lbs 12 oz. The Kni-Co Alaskan Junior is a classic sheepherder's stove well-suited for smaller canvas range, spike, and wall tents. The Alaskan Junior is the third portable wood stove I have purchased for use on my adventures. It is much lighter than my Four Dog Two Dog DX camp wood stove which is about 38 pounds just for the camp stove. The lighter weight of the Kni-Co Alaskan Junior camp stove is achieved by using 22 gauge steel as opposed to 13 gauge steel on the Four Dog. 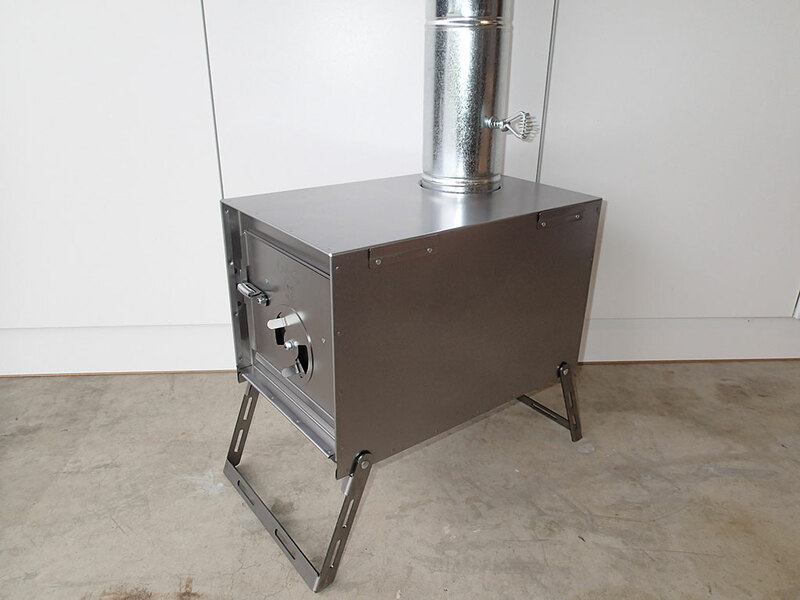 As such, the Alaskan Junior wood stove requires more care when using, such as adding about an inch of dirt or sand to the bottom in order to help prevent burnouts. It is well suited for adventures where weight is a consideration. Besides the weight, my favorite aspect of the Kni-Co Alaskan Junior camp stove are the folding legs. They are very quick and easy to use which becomes important when trying to set up camp quickly in a blizzard. When snow camping, I plan to set the Alaskan Junior wood stove on top of a 1/2" sheet of plywood to keep it from sinking into the snow. Another nice aspect of the folding legs is it is easy to raise the wood stove higher (if desired) by setting the front and rear legs each atop a piece of 4" x 4" lumber. The Kni-Co Alaskan Jr camp stove comes as oiled, bare steel, which is prone to rusting especially in moist environments. I plan to use high temperature stove paint on the wood stove to protect the outside from rust. Camp wood stoves from other manufacturers often come pre-painted, but Kni-Co leaves that up to the consumer's decision. Before painting any wood stove, be sure all grease and oil are completely removed and lightly scuff the exterior surface. My tents require the addition of an adjustable elbow to the pipe set to allow proper placement of the wood stove pipe through the pipe jack. The Kni-Co Alaskan Junior has plenty of space in the firebox to store a 5 inch adjustable elbow and an extra section of 4 inch diameter pipe if needed. While the Alaskan Junior camp wood stove is not an airtight design, the front door appears to seal very tightly. 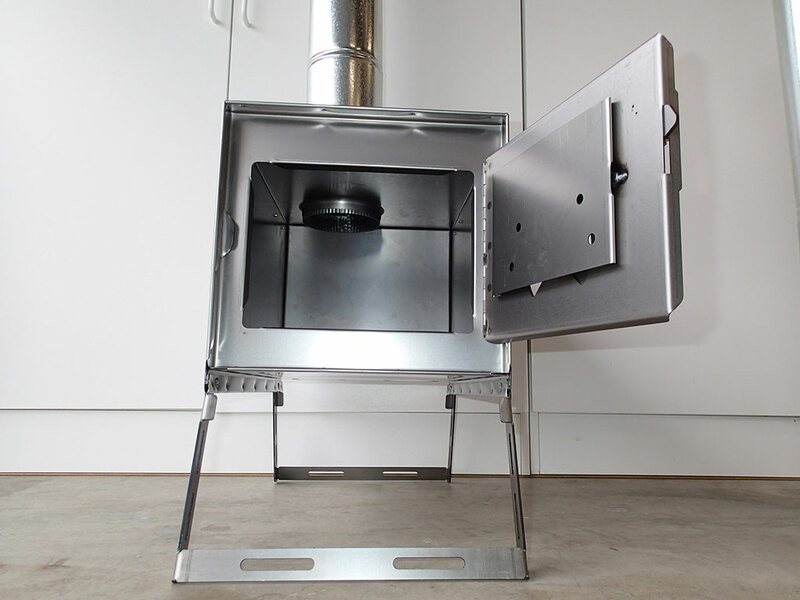 Kni-Co did a good job designing the wood stove and I look forward to trying it out. My first use of the Kni-Co Alaskan Junior camp stove was on a car camping trip over Memorial Day weekend. I love how easy it is to setup. As per the instructions, I added dirt to the bottom of the stove before lighting a fire. It takes only a few minutes from box to fire with the Kni-Co stove. I set up the stove under a canopy and could feel the warmth rolling off the stove while sitting nearby. It was a cold and wet weekend, making the stove and canopy a great combination. I cooked corn bread in my dutch oven on top of the Kni-Co Alaskan Junior wood stove. It came out very well. The stove was easy to adjust from the front and with the damper. I was easily able to get 1-2 hours of burn time with dry wood. Hardwoods will burn longer of course. I am very happy with the performance of this wood stove and look forward to using it for years to come. 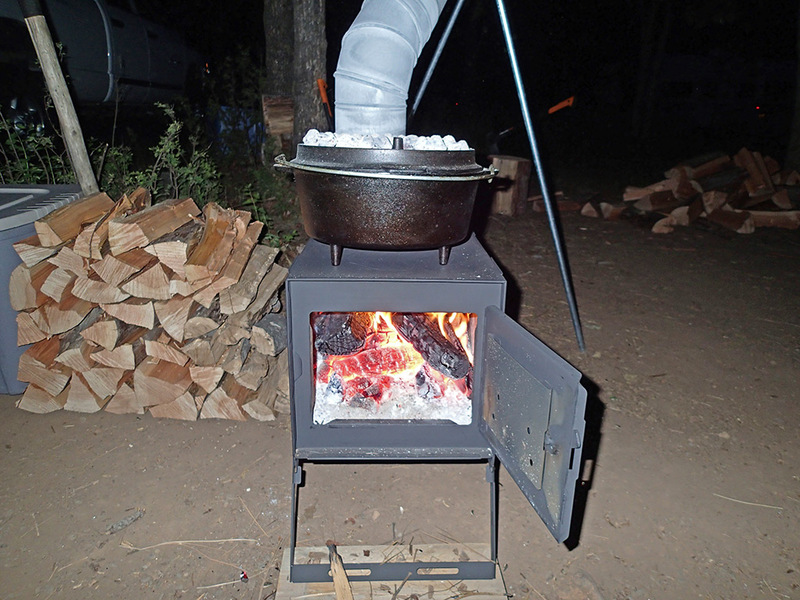 See Camping at Rock Crek Reservoir adventure where the Kni-Co Alaskan Jr camp wood stove was used. After a couple trips using the Kni-Co Alaskan Junior wood stove, I am definitely hooked. Where weight and time is of concern, it is my first choice and most frequently used wood stove. It works as well as my similarly-sized Four Dog stove. Because it is a small wood stove, it does however require adding wood every 1-2 hours, but I have not found this to be a problem. I love how simple to set up and use this stove is. It has proven to be durable, holding up to being towed in a gear sled behind my snowmobile. There is minimal warping of the firebox and my paint job is holding up well. I think the Kni-Co Alaskan Junior wood stove will be a trusty companion on my backcountry trips for many years. 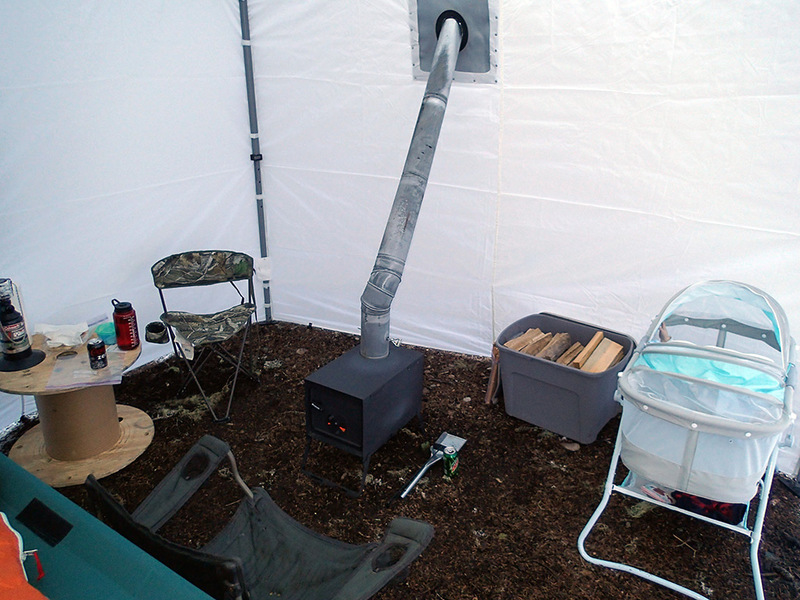 See Family Snow Day and Hideaway Lake Winter Camping adventures where the Kni-Co Alaskan Jr camp wood stove was used. 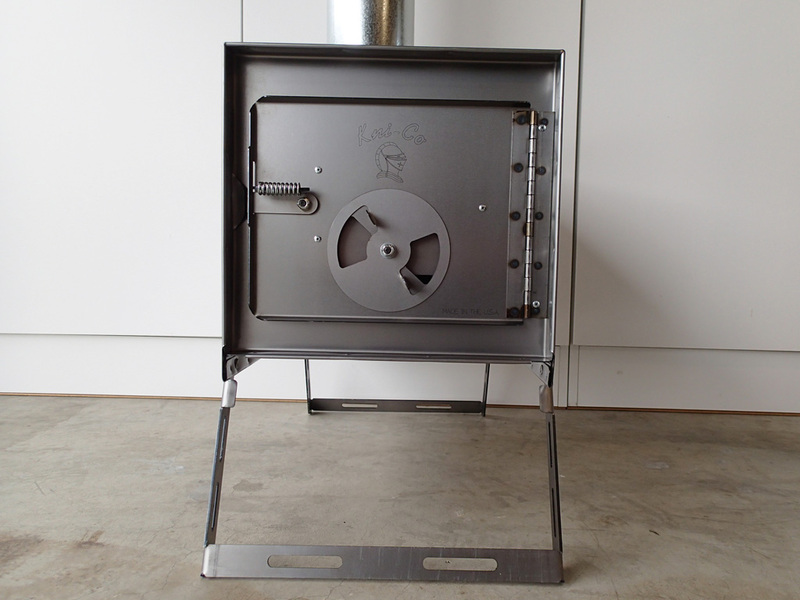 Overall I am very happy with the Kni-Co Alaskan Junior wood stove. Its combination of features and light weight make it a real winner. I find myself wanting to use it more than I should, including a Father's Day picnic (it was a hit with all the guests). If only I didn't have to work for a living, I could use this wood stove even more. Thanks for visiting Loomis Adventures. If weight is a factor, I would go with the the Kni-Co Alaskan Jr stove. It performs great. The Four Dog is a better stove, but twice as heavy. They are both made of steel, so they will both rust. I painted my Kni-Co stove to slow down the rust. 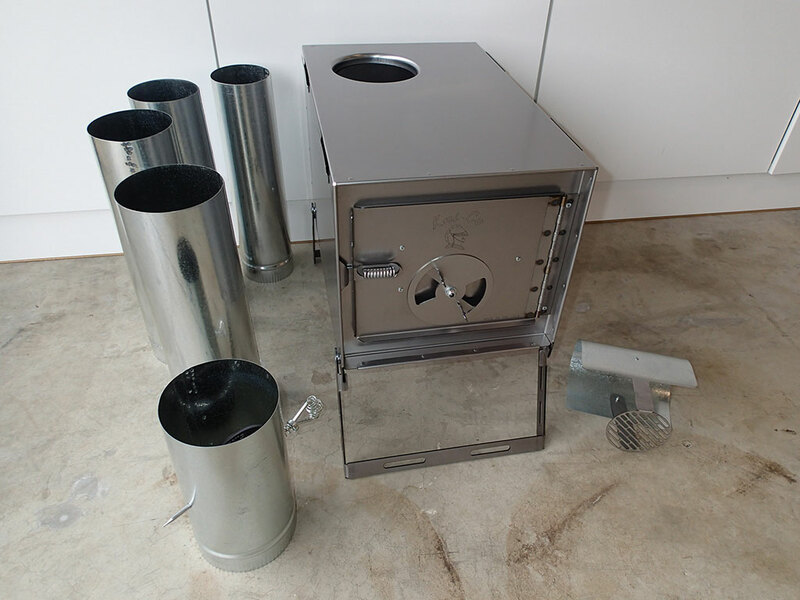 If weight is a factor, but money is not, then I would recommend a titanium wood stove. If only money was no object. If only money was no object. :) Sounds like the Alaskan JR for me. Did you use BBQ paint? Yes, I used high temp stove/bbq paint. I had to clean all the oil off the stove first.